The following manual was obtained from a public website associated with the U.S. Army. ATP 2-33.4 provides information on how intelligence personnel conduct intelligence analysis in support of unified land operations. It describes approaches used to conduct intelligence analysis and describes how intelligence analysis assists commanders with understanding the complex environments in which Army forces conduct operations. 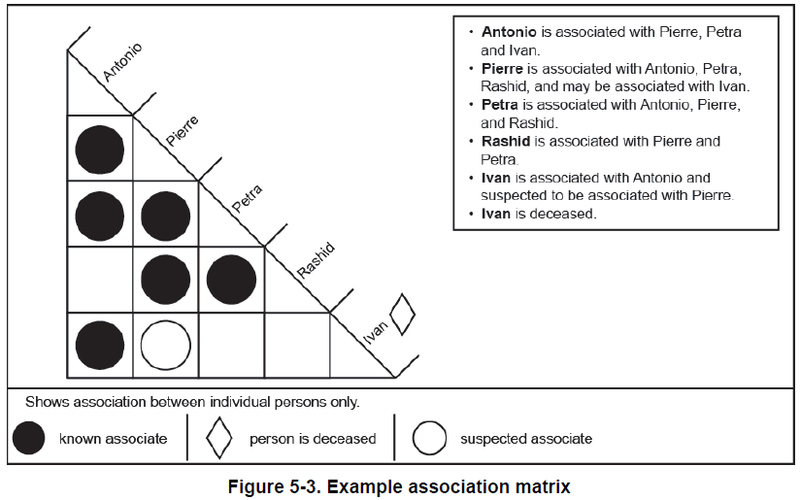 This manual emphasizes the act of intelligence analysis as a collaborative networked activity. This manual complements doctrinal guidance provided in ADP 2-0 and ADRP 2-0. ATP 2-33.4 provides direction for intelligence personnel at all echelons. The principal audience for ATP 2-33.4 is Army intelligence officers, noncommissioned officers, Soldiers, and civilians. 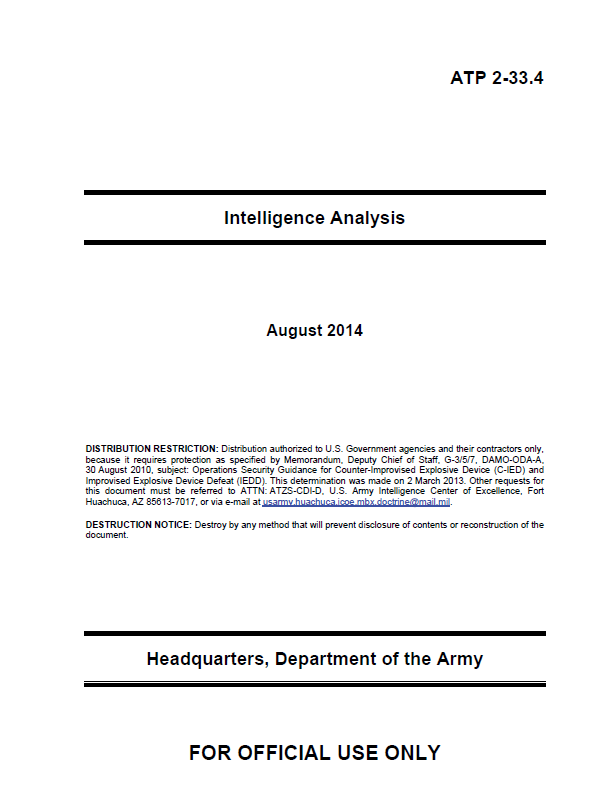 This publication provides guidelines for the conduct of intelligence analysis to commanders and staffs of Army units and is recommended for incorporation into institutional programs of instruction and unit training. Commanders and staffs of Army headquarters serving as joint task force or multinational headquarters should also refer to applicable joint or multinational doctrine concerning the range of military operations and joint or multinational forces. Trainers and educators throughout the Army will also use this manual. 1-1. Analysis is the examination of information in detail in order to understand it better and evaluate data in order to develop knowledge or conclusions. Information is processed data of every description which may be used when conducting analysis; information generally provides some of the answers to who, what, where, and when questions. Knowledge is the fact or condition of knowing something with familiarity gained through experience or association derived from information, facts, and descriptions. Knowledge helps ascribe meaning and value to the conditions or events within an operation. Analysis performed by intelligence personnel helps create knowledge in support of decisionmaking. 1-2. 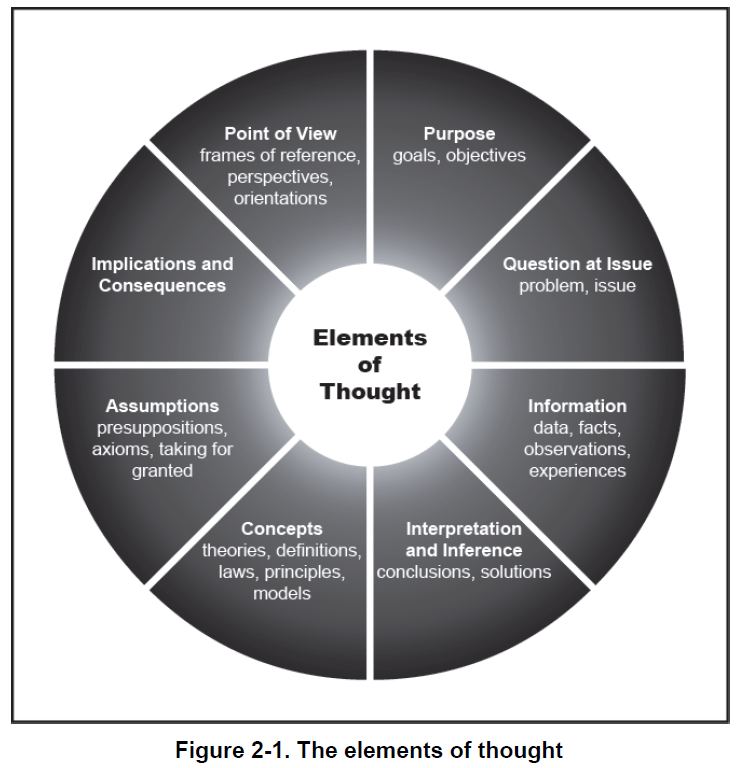 Commanders make decisions based on their understanding of the environment in which they are operating; intelligence analysis aids the commander in gaining the situational understanding necessary to decisionmaking. Forming a coherent intelligence picture during the decisionmaking process is difficult. In addition to determining how the physical environment may affect operations, intelligence personnel must assess how the presence and actions of thinking threats and civilian populations can influence situations and affect desired outcomes. Intelligence personnel must often assess extremely complex situations. 1-3. Intelligence personnel must accept and embrace ambiguity in conducting analysis. Training, knowledge, and experience are all critical parts of dealing with uncertainty. Intelligence personnel never have all the information necessary to make an intelligence assessment. To be effective, intelligence personnel must have a detailed awareness of their commander’s requirements and a thorough understanding of the intelligence process and its ability to satisfy those requirements. Combining good analytical techniques with area knowledge and experience is the best combination to provide accurate, meaningful assessments to commanders and leaders. Subject matter expertise alone will not guarantee the development of logical or accurate conclusions. Intelligence personnel must also know how to arrive at logical, well-reasoned, unbiased conclusions based on analysis. To help alleviate the ambiguity, intelligence analysts should identify gaps in their understanding of the operational environment. 1-16. Collaboration is communication, cooperation, and coordination. It is a process where two or more individuals or groups work together on a common problem or task to achieve a common goal by sharing knowledge and building consensus. Effective collaboration includes continuous dialogue that leads to increased understanding. Effective collaboration also results in identifying dissent among participants. Collaboration requires the candid exchange of ideas or opinions among participants and encourages frank discussions when disagreement occurs. Decisionmakers should be made aware of dissent among participants and be given the opportunity to review the reasons for that dissent as part of forming an independent judgment. Creating rank barriers is not conducive to collaboration. Rank does not equate to experience, knowledge, or best analytical practice. Give and receive feedback from participants. Share credit with others for good ideas. Acknowledge others’ skills, experience, and contributions. Listen to, and acknowledge the feelings, concerns, opinions, and ideas of others. Help peers or team members explain their ideas. Define problems with people or processes in a non-threatening manner. Support group conclusions even if not in total agreement. Give and seek input from others when forming conclusions. Assist others in solving problems and completing individual tasks. Ask for help in identifying and achieving goals. Notify others in a timely manner of changes or problems related to a task. Make procedural suggestions to encourage progress toward goals. Hold regular synchronization meetings to foster communication, cooperation, and focus collection among the various intelligence sections. 5-120. Pattern of life analysis is a focused analysis ofwhere and when a target has been with the intent to predict where the target will be. This analysis aids operational planning directly. Pattern of life analysis uses network diagrams and timelines to display a target’s historical movement patterns in time and space. 5-121. Pattern of life analysis should be as in-depth as possible. It should include potential refuge locations, work locations, travel patterns, known vehicles, and social activities. Pattern of life factors can and should be developed from as many sources as possible. This will require routine contact with local operational management teams, human intelligence collection teams, and the supporting SIGINT section. Higher echelon collection assets are also used to corroborate the patterns of life. 5-122. Used in concert with network analysis and/or link analysis, pattern of life analysis is useful in the targeting process to determine the location the HVI will be at, and when the HVI will be there. For example, if the analyst identifies that an HVI visits a particular restaurant, the location can be monitored as an anticipated future location of the HVI for time-sensitive targeting. Step 1. Select pattern analysis tools to be used and focus on the target as you construct it. Step 2. Construct a pattern of life network diagram, visually linking events, people, objects, and places in time and space to the target. The diagram is constructed so the flow of events is from left to right. to determine any patterns that may predict future events or places where the target may be. Ask the following questions at a minimum: What are the temporal distances between key events? If lengthy, what caused the delay? Are there missing pieces of data that may fill those gaps that should be collected? Did the analyst overlook pieces of intelligence information that may have had an impact on the events? Conversely, if events seem to happen more rapidly than expected, is it possible that the analyst has information related to multiple targets? Are certain critical events necessary for the predicted location of the target to occur? What are the intelligence gaps? What collection may fill those gaps? What are the vulnerabilities in the target’s timeline for collection activities? What events outside this timeline could have influenced the activities?